With more than 5,000 species described so far, frogs are among the most diverse groups of vertebrates on the planet. Frogs are amphibians in the order Anura and are are characterized by a short body, webbed digits, protruding eyes, and the absence of a tail. Many of the anatomical characteristics of frogs, particularly their long, powerful legs, are adaptations to improve jumping performance. 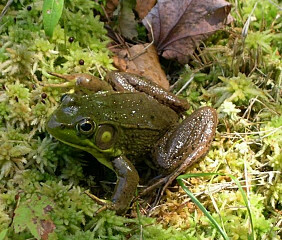 Due to their permeable skin, frogs are often semi-aquatic or inhabit humid areas, but move easily on land. Adult frogs follow a carnivorous diet, mostly of arthropods, annelids and gastropods. Frogs are most noticeable by their call, which can be widely heard during the night or day, mainly in their mating season. Here you may post messages or questions pertaining to all aspects and issues regarding the keeping, breeding, health, and conservation of species and subspecies of Frogs.